Welp, I decided to hop on the truffle bandwagon, and make cookie dough truffles for Easter/preparation for Easter. I love truffles. They are easy, delicious, and a part from the chilling part, super quick too. These are a cookie dough version. You mix it up, roll them into balls, form them into eggs and chill them. It’s really as simple as that. I love these for Easter for a multitude of reasons. You can make a lot of them in one batch and have dessert ready in no time. Especially if you are invited to someone’s house for Easter Brunch/Dinner, this is a great take-along dessert. You really can’t go wrong with cookie dough, candy and sprinkles, and aren’t they just adorable! I love cute food! I think I like looking at them, just as much as I like eating them! Description: Monday Night Brewing is a hidden little gem found in the Atlanta area of Georgia, therefore we do not get their beer here in Colorado. Lucky enough for me, Zach was just in Atlanta and brought back this S-P-E-C-T-A-C-U-L-A-R scotch ale. Monday Night has an everyday version, but also has this Bourbon Barrel Aged version. If you know me at all, you know that I’m a sucker for anything bourbon barrel aged. When I found out that this was a scotch ale, I almost had a fit. This beer is delicious. It’s very well-balanced and has hints of chocolate, caramel and fruity notes. I love it with these truffles. Normally I would go with something like a stout for sweet treats, but I couldn’t pass up this pairing. It pairs very well with sweets, and this recipe is no different. If you live in the Southeastern part of the USA, pick up some of Monday Night’s brews. You won’t be disappointed. 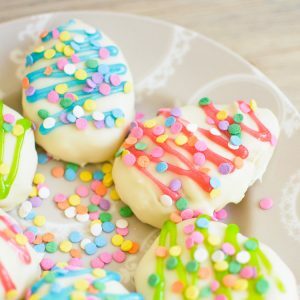 These Easter-themed cookie dough truffles are no-bake and the perfect sweet pick-me-up! In a large bowl, whisk the butter, cream cheese, brown sugar and molasses until the mixture is creamy and smooth. Stir in the flour, oat and salt until the dough comes together and no dry ingredients remain. Fold in the mini chocolate chips, if you are using them. Taking a tablespoon-sized scoop, scoop the dough onto the prepared baking sheet. I had 12 eggs, when all was said and done. Shape each scoop into an egg-shape. Cover the eggs with plastic wrap and freeze for 2 hours or refrigerate for 4-6. Once the eggs have chilled, place your candy melts in a microwave-safe bowl. Follow the directions on the manufacturer''s packaging for melting the melts. Once the melts have melted, dip the eggs into the mixture using a slotted spoon. Transfer the egg to a wire rack that has been placed upon a large piece of parchment (to reduce mess). Allow the eggs to set (this should only take a couple of minutes). If you plan on using sprinkles, be sure to sprinkle on the eggs before the chocolate sets. Store in the refrigerator for 2-3 days. Enjoy! These turned out beautiful, Justine! Welcome to the club :). Loving all of these colors, of course!! Haha thank you! I agree! Thank you so much, Jenn! I love cookie dough too ;) in all shapes and forms! Thanks for pinning!